One of the best things about any Boston team's championship run is the way fans express their allegiance. Whether it is photos or original creations like videos, songs and poems, the lengths people will go in support of the Red Sox never ceases to amaze. We have two we'd like to feature for you today. In the photo at right, Kerry Crisley of Wakefield re-created the now famous moment of bullpen cop Steve Horgan celebrating as Tigers outfielder Torii Hunter plunged over the fence chasing a David Ortiz home run ball. 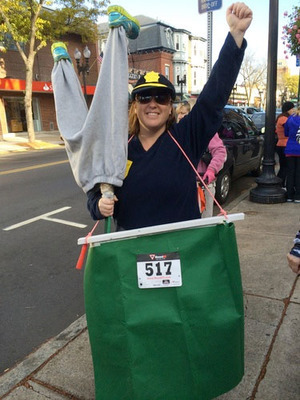 Crisley wore the costume at Saturday's Melrose YMCA Spooky Sprint 5K. "I had a lot of people taking my picture that day. They understood the reference right away, and I received a lot of great comments from fellow runners and spectators. One runner told me that the legs in the air acted as her pace-setter ... so funny and helpful," Crisley said. The video above was sent to us by Robert Woo, and takes a page from the "Tales from the Crypt" show. Local comedian Dana Jay Bein is the actor, and Woo filmed it. "We were inspired to do it after realizing Dana could do a pretty great Cryptkeeper impression a couple weeks ago and I thought it would be fun to order a mask and film as many puns as possible (as the Cryptkeeper is won't to do) in the Fenway area, since we're both Red Sox fans," Woo wrote in an email. We can only imagine what it'll be like at Fenway Park if there is a Game 7 on Thursday, which happens to be Halloween. Game 5 game time: 8:07 p.m. Weather: Temps in the 50s, no rain in forecast, according to Weather Channel. -- We'll have a live pregame show at 5 p.m. from Busch Stadium. -- Chad Finn hosts a chat session at 7 p.m.
-- Live updates begin around 6 p.m. Steve Silva is the host. -- Boston.com's Steve Silva shot two videos Sunday that give you a taste of what it's like at Busch Stadium: Check out The Scene in St. Louis to hear Red Sox fans talk about the disputed Game 3 call, and the Budweiser Clydesdales trotting around the field before the game. -- Chad Finn writes that David Ortiz's impact on the Red Sox is evident both on and off the field. -- St. Louis Post-Dispatch columnist Bernie Miklasz says the Cardinals deserved to lose Game 4 and the game-ending pickoff play was a fitting conclusion. -- On BostonGlobe.com, Peter Abraham has the full report on Game 4, Dan Shaughnessy writes the Red Sox have proven they're not going down easily, and Nick Cafardo assesses the performance of starting pitcher Clay Buchholz. Their kingdom for a lefty?